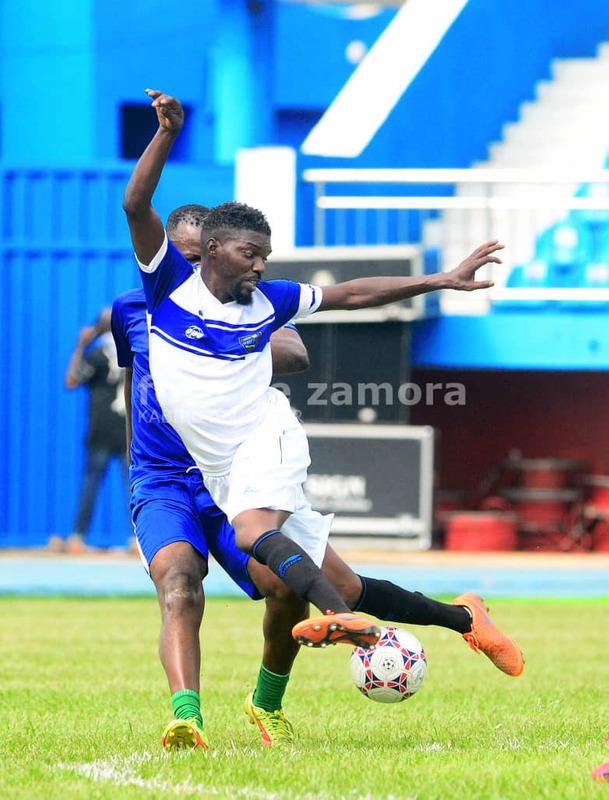 Home / SuperEagles / Super Eagles Asaba Diary Day 3: Why we lost? 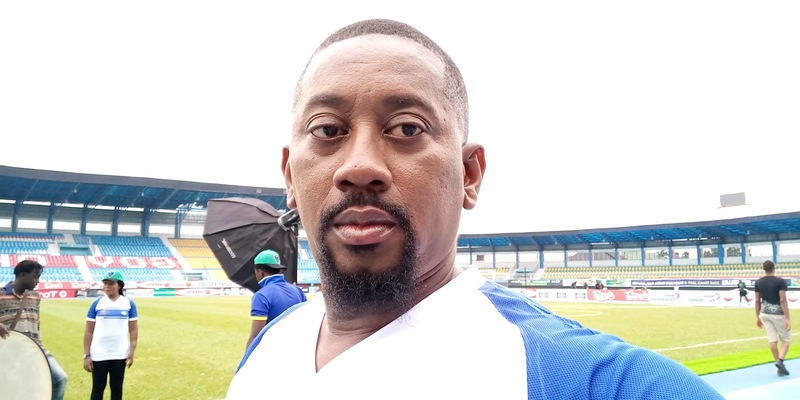 Super Eagles Asaba Diary Day 3: Why we lost? Yours truly engaged with the make up artist before the game. 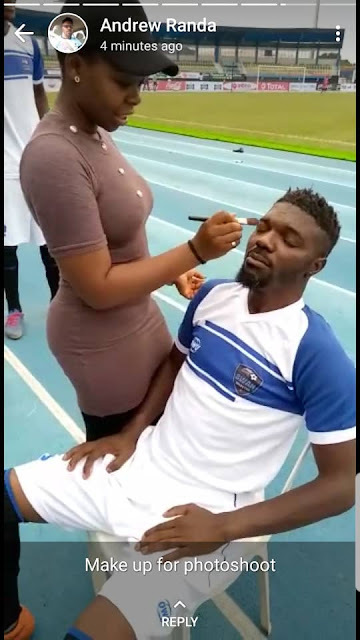 But why makeup before a game? 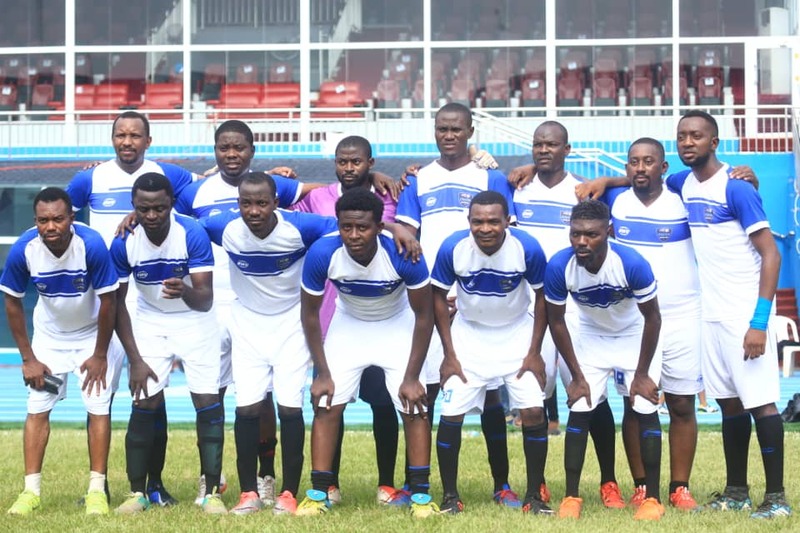 After the Eagles beat Seychelles 3-1 in their final AFCON Qualifier, it was now down to us to play our own game against the Delta All Stars- a novelty one. Arrival time at the stadium was put at 7 am because there would be a photo shoot just before the game. 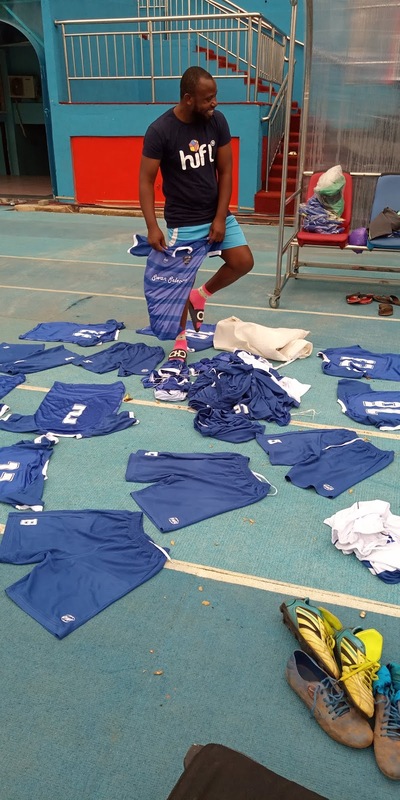 Our group had just gotten a partnership with Sportswear giants, Owu and we needed to model the kits. The only time we had was just before the game. I was already up at 5 am to post my other diary and do some stuff. At 6.30 am we were in the hotel car park and ready to roll when my car did not start. Lol. I had left the lights on since the last time I drove it twenty-four hours earlier. 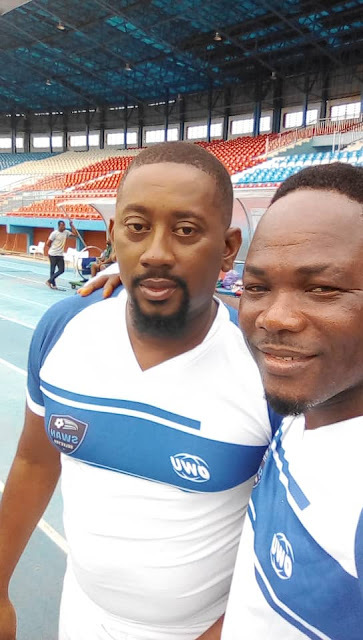 Owosports (Owolabi Aleshinoye) had to lend me his battery and as soon as we got that off our backs we were off to the stadium. 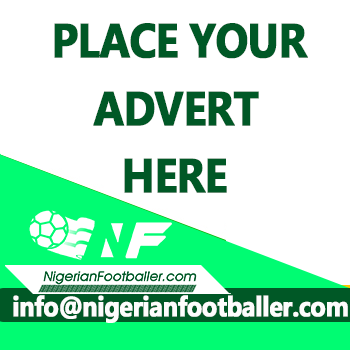 On arrival we heard that the U23 team would train from 7.30 am and then the Super Eagles. 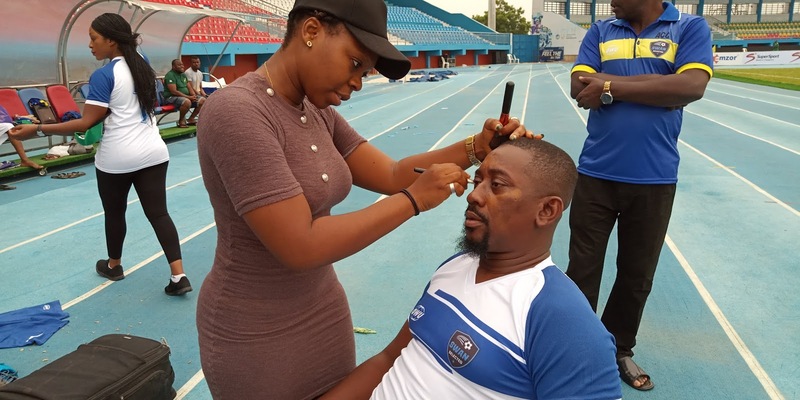 I met with Shehu Dikko and from our talk, I figured out we could squeeze into the time between both National Team training sessions to have our game, but first, the photo shoot was about to start and the makeup artist took her time to turn us into pretty and nice folk. Starting lists were read out and I would be on the bench but that did not matter to me. I was there to have a run on the pitch and exert some energy. I hadn't done those in a while. 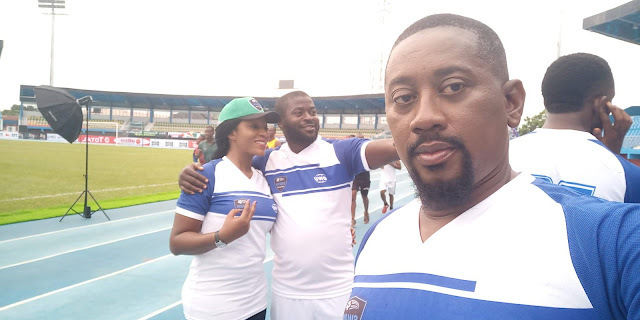 A light warm-up session led by Pikin of God was next and then the match proper. The result of the game went viral immediately it ended so that is not the topic of discussion here, but why we lost so we can end this once and for all. It was simple. We were mentally, physically and financially prepared but we met a team that had the backing of the number one football person in Nigeria. 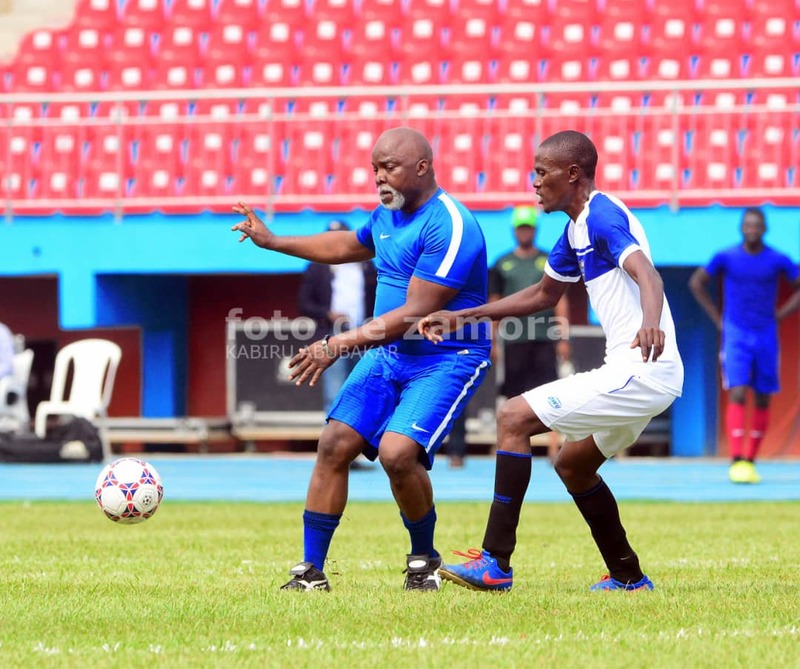 Amaju Melvin Pinnick was our opponent and it was difficult to get the ball off him. Not that he was Lionel Messi-esque or Diego Maradona-esque or even Etim Esin-esque, no! He was far from all of these. He was simply the president of the Nigeria Football Federation, Amaju Melvin Pinnick. Every touch on him was a foul against our players and it became so evident that our players just let him go past them because they were scared to get cards or be sent off. Meanwhile, our players did not get any protection from the referee as one was stretchered off injured and our midfield maestro, Shehu Dikko almost lost his legs in a vicious tackle. Andrew Randa too, our captain was at the end of some vicious tackles too. 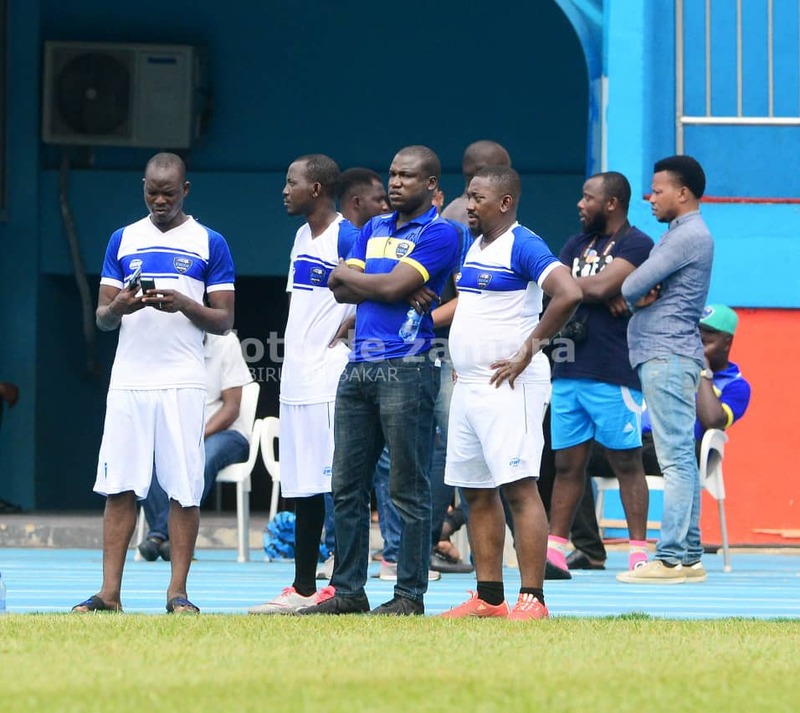 At the time Amaju Pinnick scored, it was obvious that the home side would win or we wouldn't leave the stadium alive. This all sounds like the complaints of a Nigerian League club after they lose an away game, right? 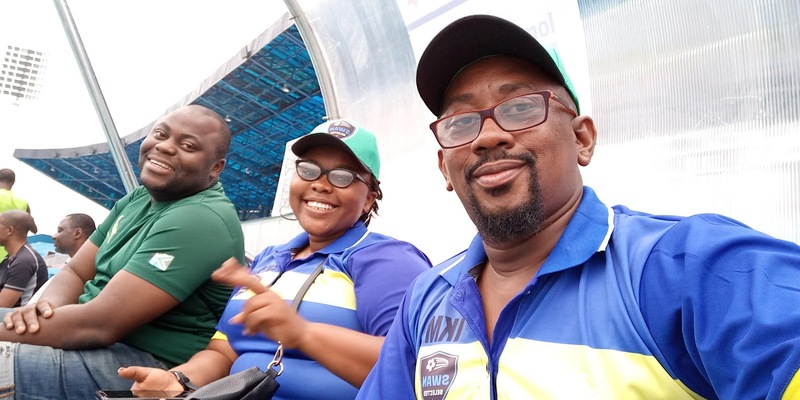 The truth is that there may have been shenanigans before and during the game but we were in Asaba to enjoy a novelty game and Amaju Pinnick as well as Shehu Dikko are top football players for their ages. 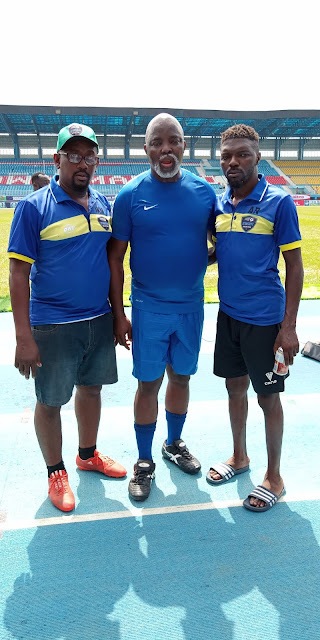 Pinnick scored a goal that a lot of NPFL players would be proud of and we are chuffed for him. It was a good game. The SWAN team lost but we could win the next one. Let the banter continue though. There is little to complain about the game. it is about friendship and camaraderie so no issue. 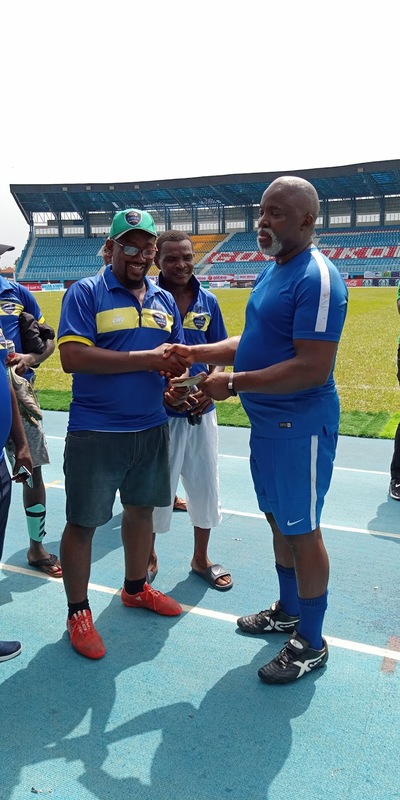 There was a prize of five thousand naira for the scorer of the first goal to be given by Corporate PH 6 which was Amaju Melvin Pinnick so I had to present the cash to him. I called Andrew Randa and Sanipe and reminded them about the presentation and they asked me if I had an envelope which I didn't, but I cheekily said I want the whole world to see me give the NFF president raw cash of five thousand naira and we all laughed. I beckoned on the NFF president and told him my mission and he got himself ready. With the cameramen waiting for the presentation, Pinnick looked at the raw cash in my hands, looked at the journalists and photographers in front of him and said to them, while referring to me, “China better say it on record why he is giving me this money before the pictures go viral and people think something else of it,” then we all laughed because he was obviously joking and trying to be part of the fun. I handed his cash over to him and then he waved it in the air, said a small thank you and the ceremony was over. Next up for me was Ndoki where I would be chairing the Local Organising Committee of the Osteen Ejiasa Ndoki Unity Cup. It was a quick drive to the hotel, check out formalities done, a quick shower and we were off to Ndoki. I made the trip with Sanipe Damiete and Chuma Nnoli. 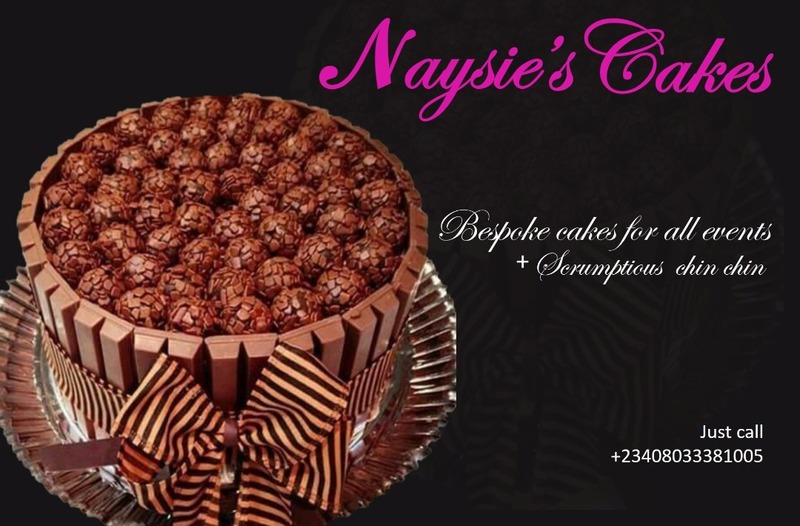 Before we left the hotel I told them we would have to strike out the next two hours of the journey because I was so sure we would be stuck at the River Niger bridge but we were not. The journey was as smooth as a baby's bottom. We were at Ndoki and planning for the opening ceremony continued. How I love the countryside. Too bad I do not feel safe in my own village, Oduoha Ogbakiri. One day, just one day, all will be well. Coach almost threw me in to rescue the game but changed his mind. Coach must go!